How To Get Your Website Made And Managed? Sometime back we have discussed about creating a WordPress based website here. Now today we will be explaining you how to use our website designing services in-order to get your website made, managed, hosted and updated by our expert web designers. 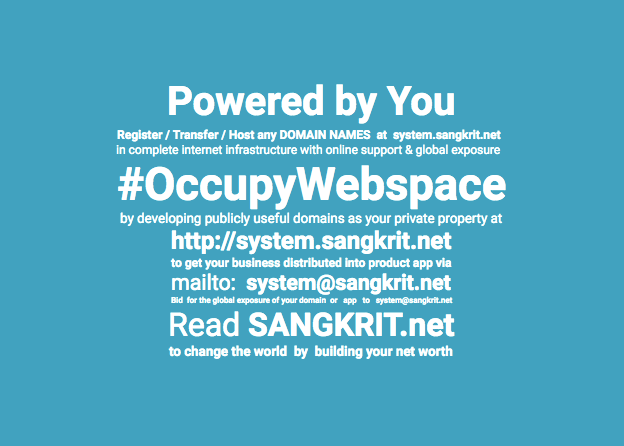 To start, first create your free SANGKRIT.net account here. After creating your free SANGKRIT.net account, subscribe to our Website Design Service, you may also include Facebook Page Design service by ticking ‘Add Facebook Page Design’ checkbox above ‘Add to Cart’ button. Our Website Design Service is specially for the people who don’t have time to create and manage their websites on their own, instead they want other programmers to design their website which not only looks terrific but works and works fast. Website Design Service connects you with a team of Internet experts called SANGKRIT.net’s Dream Design Team® who build an eye-catching, effective website ordered by you. Checkout our designed websites gallery here. Your website starts with your dream. You simply tell us what you envision for your new site via our online interview. We monitor your site along the way with 24/7 access to your Design Manager. You can view designs, send files and leave feedback. Keep your site fresh without having to make changes yourself. Our staff will make 30 minutes of updates every month, at your request. If you need a website for selling products then don’t worry, we also build eCommerce websites here! There are two affordable website designing plans: Standard Plan & Premium Plan. Our team doesn’t just hand overs you a generic website and leaves you alone on world wide web. Instead we all listen to you, we make your website and takes change of managing and updating it, we make sure your dream website reflects your style, we help you gain new customers by optimizing your site for maximum exposure, we keep you and your website up-to-date, all you need to do is just call us and we’ll change your text or update your images or whatever you like updating on your website. SANGKRIT.net is not just limited to website and weblog but we have a wide range of products which you can use for building your brand online, promoting your business and appearing in the search results of Google, Yahoo, Bing etc. All it takes is a few simple steps: First you share your vision via an online interview with us. You may tell us what kind of website you need, what are your demands, you can give examples of other websites, you can discuss layout, images and other graphics of your website, you may choose from our thousands of professional design and color combinations, you may pick up a phone or send us an email. After reviewing your information, we go to work, work on designing your dream website and then we send it through our 10-point quality control process and your website goes live on world wide web. Afterwards whenever you need updating your website, you simply contact us via email, phone or built-in support system.